How Wide is the GA Amp’s Tonal Spectrum? Walk into any large music store, and you’ll see what seems like a bazillion amps. Big ones, small ones, stacks, and combos…you name it. And, it’s really hard to differentiate them because it seems like they’re mostly versions of each other, with the same styles, same features, same sounds, same old same old. You get the idea. In a world of same-same, Roland was compelled to make a series of amps that stood out in the crowd, something with its own sound, looks, feature set and identity, and the GA amps were born. A quick look will tell you they’re not your father’s amps. For one, your father’s amps didn’t have knobs with big bright LEDS in them so you can see your settings onstage. The GA amps have memory, too. There are four locations, plus what Roland calls Manual, which means the amp will sound like whatever the knobs are currently set to, so in effect you really have five instantly available tones. If you select a different Memory channel, you’ll see the knobs switch to the stored settings. If you decide to tweak the memory, you don’t even have to write it in. The amp will remember your tweak the next time you use that channel. How Does the GA Amp Tonal Spectrum Compare to Others? The tonal spectrum of these amps is much different from pretty much every other amp around. 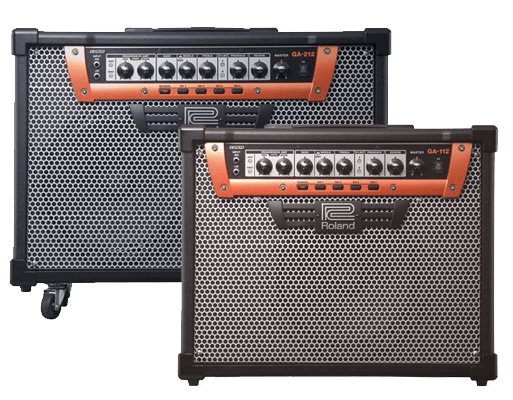 Using very advanced Roland technology, these amps can go from super clean amp tones to sustain and gain far beyond other amps — very far beyond. The amp without any tweaks can deliver as much crunch and gain as other amps just by turning the DRIVE knob up. And if you get to try one, watch the big LED change color to indicate the type of distortion. To go beyond what other amps can do, one press of the BOOST button will take the GA amp’s sustain and gain into hyperdrive. With the DRIVE knob all the way up and BOOST, you will experience sustain unlike any amp you’ve ever tried. We leave you with this video of Rob Marcello demonstrating the GA Amp. This video is a bit longer, but for the purpose of this post we’re starting you right where he begins to describe the tonal spectrum. Also, be sure to checkout the GA Amp Roundtable post with Jeff “Skunk” Baxter (Steely Dan, The Doobie Brothers), Ritchie Fliegler (amp historian, author, and former Marshall and Fender product designer) and Michael “Nomad” Ripoll (professional session, studio, and touring guitarist) for their real world use of this breakthrough amp. Want to get deep? Here are more specs and sound examples: GA-112 & GA-212.